The purpose of this program is to empower the private and corporate waterfront communities with the knowledge and ability to assist law enforcement. Anyone can assist by identifying observed criminal or terrorist behaviors, and alerting law enforcement. Call 866-4-SAFE-NJ (866-472-3365) to report tips or information about suspicious activity or behavior you think may be related to terrorism. In an emergency, call 911 or your local police. Your suspicions must be based solely upon the behavior and conduct of the person, and not upon the race, ethnicity, or national origin. Anything you report must be inadvertently observed and you must have a legitimate reason for being in the place where you make the observation. Board or walk onto anyone's vessel or property. Conduct searches of anyone, their vessels, cars, or personal property. Attempt to detain or follow suspicious people. DO NOT intervene, let us in law enforcement do our job, with your help. DO take extensive notes, and photograph the incident if possible without drawing attention to yourself. Include in your notes everything observed, even if you think it is unimportant. 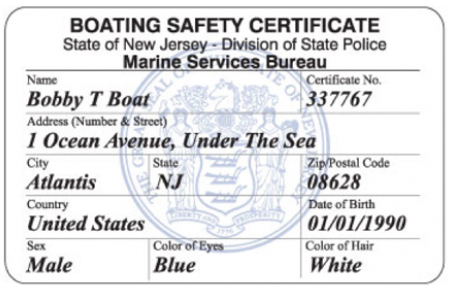 As civilians, you can often distinguish between legitimate boating or waterfront activities and suspicious or criminal activities. People engaged in Criminal or Terrorist Activity will often display patterns of behavior and engage in specific actions which are intentionally designed to conceal, disguise, or divert attention away from their true criminal intentions. This behavior is generally inconsistent with normal, everyday boating activity. These indicators are not usually, by themselves, criminal in nature. Indicators can alert people to possible criminal activity. Indicators may be looked upon as building blocks upon which investigators make determinations about possible criminal or terrorist behaviors.